Snyder Auto Group is now offering endless options for the 2018 Chevrolet Traverse and is conveniently located near Toledo, Ohio! Each signature Chevy trim has something unique to offer, ranging from matte black designs to shiny chrome accents. With six different models, you’re sure to fall in love with at least one! The Traverse LS offers black moldings and body paint-matched door handles. The high intensity headlights and LED running lights will light the way wherever you go. Drive in style with the 18” aluminum wheels that sport a bright silver paint job that matches the chrome accents on the grille. If you like simple and sophisticated, this is a look you’ll love! The Traverse LT offers the same black moldings and body paint-matched door handles but the LT brings more chrome accents to the table. The rear view mirrors are paint-matched with chrome covers and LED turn signal indicators for extra visibility. The black and silver roof racks, 20” aluminum wheels and Halogen fog lights make the LT one step up from the LS. The Traverse RS features an overall matte, sporty look for this mid-sized SUV. The iconic gold bowtie takes on a new look of black with a chrome outline; a style that’s quickly populating Chevys everywhere. The RS model generously presents black moldings and trim with a hint of chrome. The 20” black wheels effortlessly complement the Signature Black Ice grille and Bezel fog lights. If you want to drive a statment car without the bright colors, the Traverse RS is without a doubt the SUV for you. One step above the RS is the Traverse Premier. The LED D-Optic™ headlights, chrome accented grille and paint-matched side mirrors with LED turn signal indicators make this a best selling model. The paint-matched lower body moldings and chrome accents highlight the 20” Argent Metallic aluminum wheels without taking anything away from design of the rims. If this model grabs your eye, be sure to check out the Chevrolet Traverse in the Redline series. Can’t choose between the RS and the Premier? Try the Chevrolet Traverse Redline, which features colors and moldings similar to the RS without sacrificing the Premier model options and is also another great option for Ohio residents. The redline model offers the same matte, sporty look as the RS, but includes red accents throughout the design. The 20” glossy, black wheels are accented with two red stripes that match the red and black moldings. The black door handles and smoked out tail lights give the Traverse a taste of the sports car look without compromising its three row seating and storage area. Still not impressed? Stop out at Snyder Auto Group near Toledo and see for yourself our top-of-the-line model: the High Country. 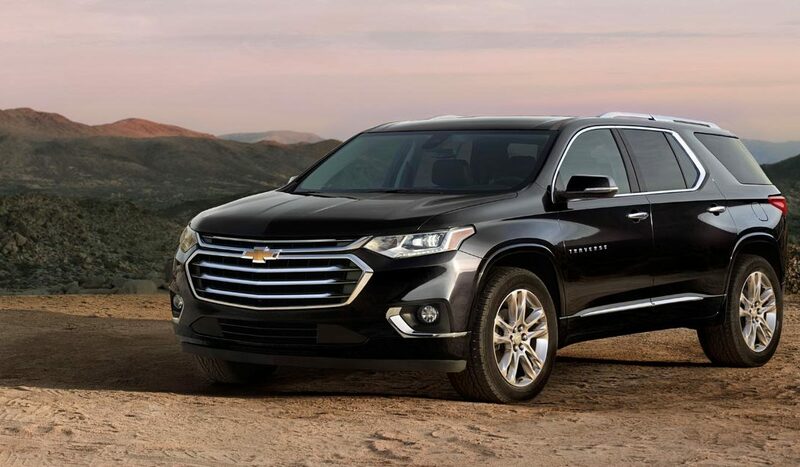 The Chevrolet Traverse High Country is assembled with every safety and convenience packable available on any Traverse. The grille on this model was uniquely designed to go nicely with the 20” polished aluminum wheels and chrome moldings. The power-folding third row seating and Jet Black (or Loft Brown) interior colors are exclusive to the High Country Model. If you’re someone who loves all the bells and whistles, this SUV will blow your mind. Do you want to drive the nicest Chevy Traverse in Toledo, Ohio? Come on out to Snyder Auto Group so we can hook you up with yours today!